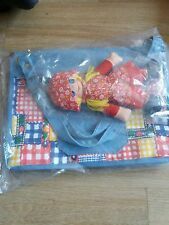 Childrens handbag with inclusive doll, main colour blue with patchwork pattern. Open top and side pocket. Adjustable shoulder strap. 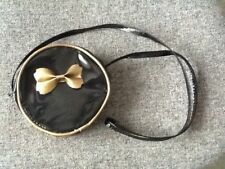 Approximate size 25cm h x 31 cm w x 6cm d.
Girls Black Shoulder handbag with zip at top and gold bow for those special parties. Ideal also for a party present. Unicorn rainbow bag Your name added for free if required Size 32x35x12cm, 16 litres, 58cm handle Please state in a message when ordering the name you require printing if required. Fancy a different colour bag, please message us. This enables us to continue giving you best deals. A cute short handled handbag featuring cinderella on the side. Zip fastening for easy access. 3 INSIDE Zip Pockets (1 With Zip). One Outer Velcro Pocket. Handmade. Used but in very good condition. Top of strap to top of bag 32cm Bag is 25cm deep and 27cm widest part. Choose 1 x small girls cotton bag. New listingGirls crocheted bag in cream . Girls crochet bag in cream with blue pattern on front, plain on back. 2 handles. Well used, zip pocket inside has ripped but otherwise good condition. Handmade bag 100%cotton, fully lined, Approx size: 15ins long 11.5ins wide Ideal fairy gift for children! PayPal only No returns Any questions please don't hesitate to contact me. Personalised LOVE Tiles Cotton Bag. Personalise this LOVE Cotton Bag with up to 2 lines of 20 characters each. Perfect as an eco-friendly alternative to plastic bags, this 100% cotton bag is made from a sustainable material and is fashion forward. Children's alphabet tote bags in grey with gold writing. 26cm x 32cm Various letters available. Velcro front pocket sealer. Circular design. Handmade cute design. Unicorn Design. Shoulder Strap Length:33.5"/85CM Note Bag Size: Approx.5.9 9.4"/15 24CM. You can put coins for your children. Kids Boys Girls How to Train Your Dragon Backpack School Bag Travel Rucksack 16"